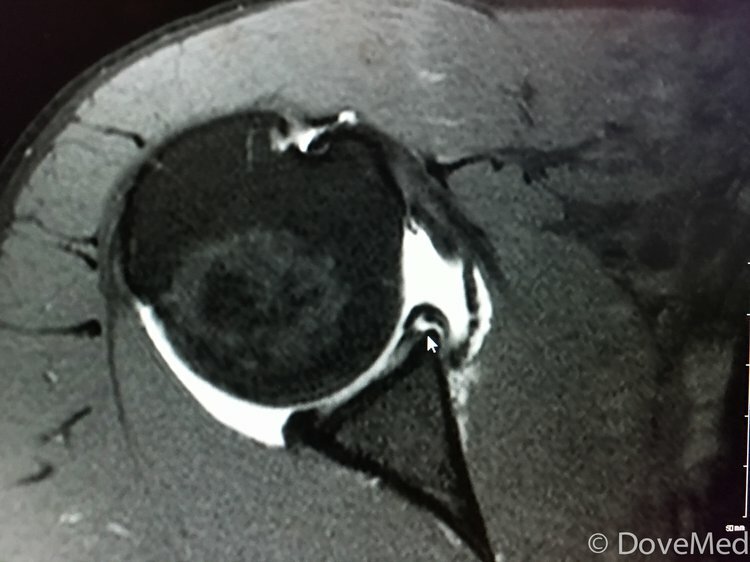 MR scan with contrast of the Shoulder Joint arthrogram showing rotator cuff tear. An Arthrogram is an advanced imaging technique used to evaluate a joint in the body. What part of the Body does the Arthrogram Procedure involve? Why is the Arthrogram radiology procedure Performed? What are the Alternative Choices for the Procedure? There are no alternatives to an Arthrogram radiology procedure. There are no recent advances to an Arthrogram radiology procedure. What is the Cost of performing the Arthrogram radiology procedure? The cost of an Arthrogram procedure depends on a variety of factors, such as the type of your health insurance, annual deductibles, co-pay requirements, out-of-network and in-network of your healthcare providers and healthcare facilities. In many cases, an estimate may be provided before the procedure. The final amount depends upon the findings during the procedure and post-operative care that is necessary. Also, if the procedure involves multiple steps or has many alternatives, the patient may take a second opinion to understand and choose the best one. They can also choose to approach another physician independently. How does the Arthrogram radiology procedure work? X-rays, produced by the machine, either pass through or are deflected by parts of the body. How is the Arthrogram radiology procedure Performed? The Arthrogram radiology procedure is usually performed as an outpatient procedure at a hospital. The Arthrogram radiology procedure is performed by a radiologist. The time of the procedure may vary, but if the Arthrogram procedure is performed with continuous X-rays or CT, it should take less than 45 minutes. If the procedure is performed with MRI, it may take over one hour to complete. A radiologist interprets the results of the Arthrogram radiology procedure. A physician will request your consent for the Arthrogram procedure using an Informed Consent Form. What are the Benefits versus Risks, for this Procedure? What are the Limitations of the Arthrogram radiology procedure? What is an Arthrogram procedure? What are the possible side effects from the procedure? How can I minimize these side effects? Are there any lifestyle restrictions or modifications required, after the procedure is performed? Is there any medication that needs to be taken for life, after the procedure? What is expected during the Arthrogram radiology procedure? A local anesthetic is administered to numb the skin and areas around the joint capsule. There is no blood loss involved during an Arthrogram radiology procedure. What are the possible Risks and Complications during Arthrogram radiology procedure? What Post-Operative Care is needed at the Healthcare Facility after the Arthrogram radiology procedure? No post-operative care is need at the healthcare facility following an Arthrogram radiology procedure. What is to be expected after the Arthrogram radiology procedure? If the swelling and pain persists 2 days after the procedure, contact your healthcare provider. What Post-operative care is needed at Home after the Arthrogram radiology procedure? In general, no additional recover time is required and one may be able to resume normal activities in 24 hours. An Arthrogram radiology procedure does not involve the removal of any body tissue. When should you expect results from the pathologist regarding tissue taken out during the Procedure? Since no tissue is removed during the procedure, a pathologist does not get involved in the care of the patient. Who will you receive a Bill from, after the Arthrogram radiology procedure? The patient is advised to inquire and confirm the type of billing, before the Arthrogram procedure is performed.